With public and private cloud emerging as true business tools, it's time to learn how to improve agility by easily tapping into new capacity resources. Many organizations have now entered into the cloud marketplace. Today’s modern infrastructure is driven by more data, more users, and more companies connecting the WAN to retrieve various services. Part of the problem facing many of these organizations is the direct understanding of the cloud and where it can continue to grow and be agile. How can I take advantage of the vast array of cloud resources while retaining control and governance? How can I make public and hybrid cloud sourcing part of my IT strategy? And how can I possibly manage it all? In HP’s white paper, the conversation revolves around an intelligent system capable of answering the above questions. In many cases, HP CloudSystem offers the answer. Part of the HP Converged Cloud architecture, HP CloudSystem lets you safely burst workloads to cloud resources when you need additional computational headroom or when you want to take advantage of additional capabilities. 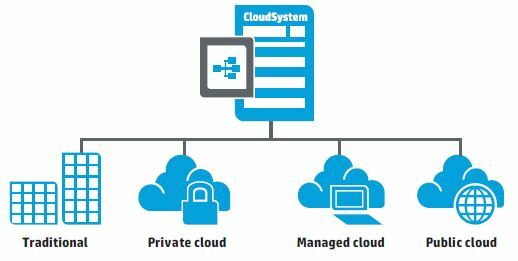 The powerful part of the HP CloudSystem is that an organization can leverage the power of both a private and public cloud environment. This type of flexibility can help an IT environment directly align with the goals of the company.